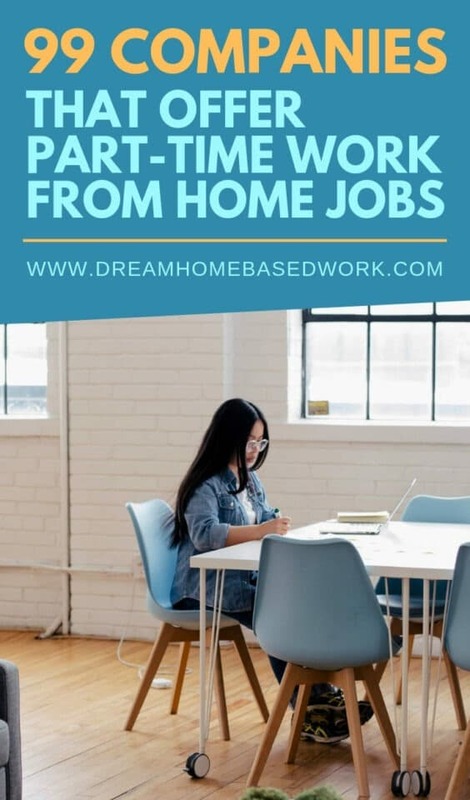 Part-time work from home jobs is ideal for stay at home moms, college students, and young teens who need the flexibility to balance work and life. I have shared a monster list of companies that will allow you to work part-time schedules. I also recommend FlexJobs, a highly trusted work at home job board with flexible, part-time, scam-free jobs. Working from home as a chat support agent is one of the most popular non-phone part-time work from home jobs. Your role involves assisting customers by chat or email. Go here for a list of legitimate work at home chat jobs. Need extra money by taking online surveys? Here are some 18 FREE paid survey sites to use. You May Also Like 50 Legit Work at Home Jobs That Pay $16 Per Hour or More! Even bookkeepers can work from home part-time. If you have the knowledge and ability to work as an accountant, this job may be for you. A data entry work from home job is ideal for those who have small children or a noisy background. 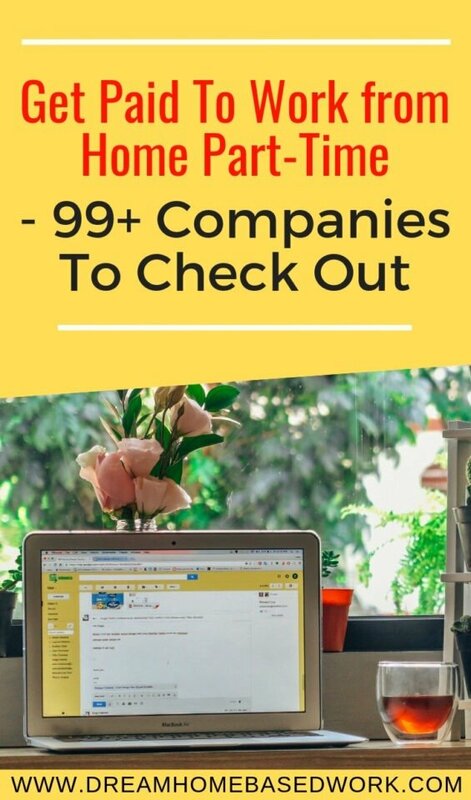 Here are some companies that offer part-time work at home jobs in the data entry field. Most times data entry jobs are hard to land due to the popularity. I recommend signing up with Swagbucks.com and CashCrate.com, where you can start earning money today! Freelance writing is a way to express your creativity in the form of words. If you have excellent grammar and research skills, you can deliver great content and get paid for it. Have you ever considered managing comments in forums, deleting blog comments, or perhaps cleaning up fights in chat rooms? Then you can work from home as an online moderator. Product Testing is one of the easiest ways to make money from home part-time. Many companies will pay anywhere between $5-$150 per product you review. See more product testing sites here. Medical coding and transcription are very rewarding careers. Most companies will require you to have at least 2 years of experience to work in this field. Find more high-paying teaching jobs at VIPKid.com. Your role as a mystery shopper involves calling businesses and asking about products or services. This part-time work at home job is ideal for stay at home parents with a noisy background. Virtual assistants can also be called virtual administrative assistants. Your role is to provide assistance to clients from a home office in the form of administrative, technical, social or creative. Here are some companies that offer part-time work at home jobs as a Virtual Assistant. Still Need More Job Leads? P.S. If you found this information helpful, please take the time to like my facebook page and subscribe for weekly blog post updates. nice information is delivered by you in this post thanks for such informative post. very good article. thanks for sharing nice imformation. Hi Shay! I see you’ve featured the Happiness Engineer role at Automattic in your list of part-time support agent jobs. I want to clarify that we only hire for this position in a full-time role. We don’t hire for any part-time positions at Automattic. Hi Deborah! Thanks for reaching out. I will definitely remove the job from the list. Thank you! thanks for the list,lashly I am following all your articles,its quiet useful and helpful for all the job seekers,keep doing this this great work,keep sharing with us. Why is it that every site so far I have visited for part-time work available now! is wanting a fee or payment? You have a great abundance listed that is for sure however, there is always a charge. This is never mentioned. Truly. Is there any that don’t want an upfront amount to get started? Hi, Vivien! Thanks a lot for your feedback. Do you have experience managing social media activity, writing articles, tutoring, etc.? When You are updating your site, please also mentioned the jobs related to Photo retouchers and video editors. coz my expertise are in these fields but i haven’t found anything like that ..
Hi! I’m from Sri Lanka. Are there any worldwide part time jobs hiring from my region? Ratracerebellion as indicated on this post does not hire from my country. Please indicate other websites which hire from outside US, especially from South Asia. please update your site, some jobs and surveys are out dated. Thanks for your feedback. I am in the process of updating the links on my site. Hi Kaytia! Thanks for writing in. There are some jobs listed here for teens https://www.dreamhomebasedwork.com/online-jobs-for-teens/. Hope this is a start! Hi! I would suggest looking at some of these options for college students https://www.dreamhomebasedwork.com/online-jobs-for-college-students/ These jobs are either part-time or flexible enough to work around your own schedule. How about Indian people. Any companies offering these opportunity to Indian’s or overseas? I started working for nexusop on 8/4/16, little skeptical at first, but they have lived up to what they say, paid on time, every week and accurately. Just got paid today! YaY! I been working there about a month and love just signing in and working and all my checks come on time – they are usually in on Thursday before time. Which one of the jobs did you pick to work from home? I have been looking for a while. Any assistance you can provide would be greatly appreciated. Do you need to have a headset? Hi Haylea! Which company are you referring to? I enjoy working for NexusOP! It’s a great opportunity to learn new careers and the hours are flexible. Pay is weekly and there’s not a lot to complain about especially if you’re looking to make extra money. I juSt wanted to let you know, #3 Cloud Crowd under Data Entry gives an error that the site is not found. Hi Priscilla! Thank you very much for informing me. I have updated the link! Hi Lisa! I really appreciate you sharing such kind words 🙂 You have an amazing site as well. I’ve checked out and shared your article several times on Pinterest. It is a blessing for us to keep helping people find legitimate opportunities. Thanks for taking the time to connect with me. Many Blessings! Would you mind sharing which company you worked for from the list that Lashay provided. I would really appreciate it thanks in advance! Ps. I want to work from home and be able to take care of my 2 year old. I wrote a post on this very topic also. Christopher (the comment before mine), stated that a particular company didn’t fulfill their agreement to him. If you went to one particular work from home forum, you would get valuable feedback like this before you even apply because some jobs look very appealing on the outside, but on the inside, it can be a completely different story. Keep up the great posts Lashay! Rev.com is a good company to do transcription work if you are just starting out, as they’ll hire newbies if they pass their transcription test. The pay is not the greatest with them but once you build up some experience you can apply for companies that pay better. I actually just wrote a post on my blog of four legitimate ways to earn money online, including general transcription.